In our day-to-day lives we all make concessions, bargains, and negotiations with ourselves and those around us all in an effort to get what we want while, ideally, limiting harm to others. We tally these transactions unthinkingly, unlike our expenses, which we tally carefully. We may or may not follow the stock market, but it’s hard to escape the endless repetition of “the jobs numbers” from news media. NPR’s Marketplace Morning Report is such a huge part of my own morning routine that if I hear the phrase “let’s do the numbers” before I’ve arrived at work then I know I’m running late. 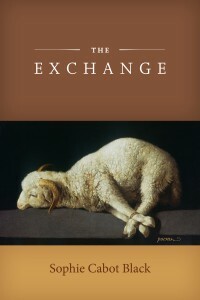 Every one of these exchanges is fair game as stimulus in Sophie Cabot Black’s latest collection of poems, The Exchange, and they are all woven together in tightly wound lyric poems that maintain emotional resonance, never feeling like statistics. Not that there are columns of numbers here by any stretch. Cabot Black manages to write poems about called “High Finance” and “Preservation of Capital” without losing any sense of what it means to be human. She’s more interested in the definitions of the words than the numbers the words refer to. Cabot Black appeals to the emotions of people rather than the cold logic of the market. I took care of someone else. We not only “Pay Attention,” but we pay bills, we pay heed, and we pay homage. We’ve built our idioms on ideas of owing and owning. These poems are unblinking, viewing grief in all its complexities, trying to sort out the knot of friendship and sadness. There is no excess language in Cabot Black’s poems, and what is there is taut and urgent. There’s an exchange between less and more that Cabot Black navigates—something being necessary to creating a poem; too much being clunky and undesirable; too little being frustrating and opaque. Only a handful of these poems spill onto a second page, but there is a tension in saying only what is necessary that Cabot Black maximizes, and each of the poems in this collection stands on its own as a well-made poem. The Exchange explores the language of financial collapse, defining in poetic terms the words we’ve been inundated with from the media over the last few years. There is plenty of language to mine in the financial world and Cabot Black deftly weaves them into her own poetic voice to create a collection of poems that will serve as a historical marker, but also as a reminder of the way language can be used to conceal and uncover the schemes that are used to fuel greed, often at the expense of the voiceless many. What other writers use or used current events as inspiration for their creative work? How have these works held up since the events have passed?